The government on Tuesday notified a rule that would allow the National Commission for Backward Classes — a statutory body — review its own decision of rejecting inclusion of a caste group in backward class list. The amendment comes after a protracted agitation by the Jats demanding their inclusion in Central list of OBCs. The NCBC, in 1998, had rejected the OBC status to Jats.The NCBC (constituted under an Act of Parliament of 1993) examines requests for inclusion of a community in the Central List of Backward Classes, hearing complaints for and against and thereafter tenders advice to the Central government. But the present rules do not allow the commission to review its own advice. The notification of May 3 vests in the Commission the power to review any advice tendered by it to the government. “Aggrieved may apply to the Commission for the review of such advice in accordance with relevant provisions of the Civil Procedure Code.” “The Commission will have the power to review its advice in accordance with the relevant provisions of the CPC relating to review by Civil Courts,” the notification said. A blockade of rail and road network between Delhi and Uttar Pradesh in March by the Jats resulted in major disruption of the services. 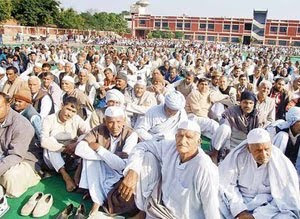 Following assurance from the government to amend the rules, the Jats suspended their agitation. The fresh move might pave way for reservation for Jats in the central services, but could also re-ignite such rejected demands of other communities.